Around the world, criminals are selling people for profit. Vulnerable women and girls form the majority of human trafficking victims, including those driven into degrading sexual exploitation. Trafficked persons are often tricked into servitude with the false promise of a well-paid job. Migrants crossing deadly seas and burning deserts to escape conflict, poverty and persecution are also at risk of being trafficked. Individuals can find themselves alone in a foreign land where they have been stripped of their passports, forced into debt and exploited for labour. Children and young people can find their lives stolen, their education blocked and their dreams dashed. It is an assault on their most basic human rights and fundamental freedoms. Many millions of vulnerable women, men and children are being cruelly exploited coerced into working in factories, fields and brothels or begging on the street; pushed into armed combat or forced marriages; trafficked so their organs can be harvested and sold. We are living in an era of many crises and troubles, as United Nations Secretary-General Ban Ki-moon has warned. Record numbers of people are fleeing war and persecution, and the international community is grappling with acute migration challenges in the Mediterranean, the Balkans, in the Andaman Sea, Latin America and Africa. For human traffickers, these hardships represent business opportunities. The world is facing many grave challenges, and our resources are strained. But we cannot allow unscrupulous criminals to exploit these crises and take advantage of desperation and suffering. No place in the world is safe: the latest Global Report on Trafficking in Persons by the United Nations Office on Drugs and Crime found that the trafficking victims identified in 124 states were citizens of 152 different countries. More and more detected victims of trafficking are children, especially girls under the age of 18. Over the past decade there has been no significant improvement in the overall criminal justice response to this crime. In the period covered by the Global Report, some 40 per cent of countries reported less than ten convictions per year. Some 15 per cent did not record a single conviction. This illustrates a level of impunity which is unacceptable and highlights the fact that, at the moment, the traffickers are getting away with their crimes. 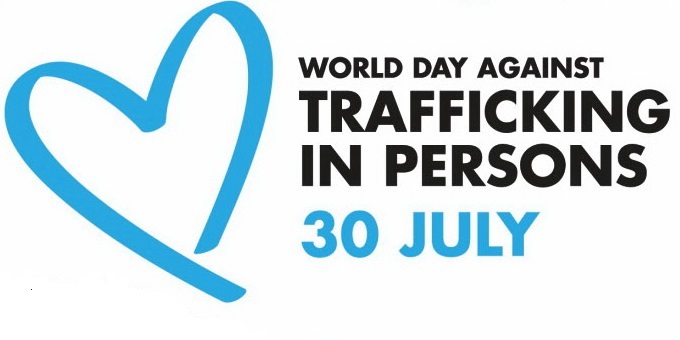 30 July is United Nations World Day against Trafficking in Persons, established to raise awareness of the plight of human trafficking victims, and promote and protect their rights. The international community must work together to protect the human rights and dignity of trafficked persons, as well as to prosecute perpetrators. To prevent trafficking, we must address its root causes and the factors that increase individuals’ vulnerability to trafficking, including poverty, unemployment, poor access to education and continued gender inequality. The specific needs of women and girls must be addressed, including through measures to empower them. We must redouble our efforts to stamp out trafficking in persons, to return hope to those who have suffered this injustice and to build a future where these crimes no longer threaten any person, anywhere.